So, your trusty pancreas no longer effectively regulates your blood glucose levels, huh? Untreated, chronic and acute diabetes can cause serious medical complications. Have no fear; Setu's Sugar Soldier is here! Our all-natural daily supplement will help you address hyperglycaemia the healthier way! It is formulated with gymnema sylvestre - known to reduce sugar transport in the stomach and protect pancreatic beta cells, where insulin is synthesized, stored and released. Bitter gourd helps support insulin sensitivity and secretion. In addition, master antioxidant Alpha Lipoic Acid counter high levels of oxidative stress, a condition common to those who suffer from hyperglycaemia. 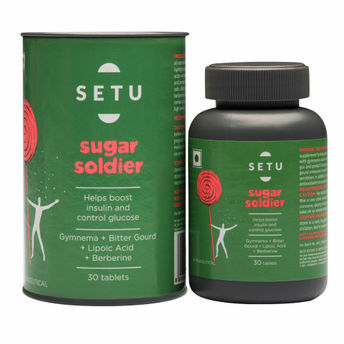 March against diabetes with Setu's Sugar Soldier.